TORONTO — A series of old historic photographs from the Polish shtetl of Staszow has been quietly wowing visitors since being installed in the Stashover-Slipia Synagogue on Sultana Avenue in Toronto. The photographs are to remain on permanent display in the shul’s lobby. “Everyone notices them when they come in,” says synagogue president Jay Safer as he points out the various groups of framed photographs in the newly renovated space. 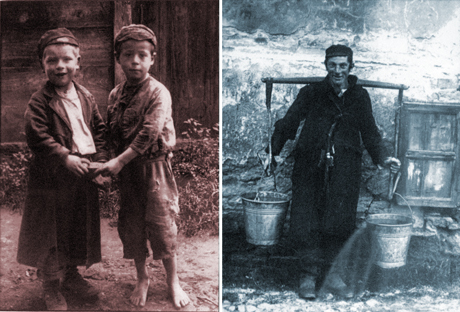 Offering a rare window into a lost world, the photographs show the marketplace, the mikvah, the cemetery,and other locales of Staszow (pronounced “Stashov”) before the Germans destroyed the Jewish community. The photos range from the late 1890s to the 1930s. The exhibit includes portraits of local personalities such as a fiddle player and the town water carrier. For poignancy, many of the photos seem to match the work of Roman Vishniac, who famously chronicled prewar eastern European shtetl Jewry with his camera. There are group portraits of the Jewish soccer team and the socialist organization, the Bund, as well as shots of ragged children and elderly men with wizened faces and straggly beards. There is a beggar, a pipemaker, a seller of tallitot, even a portrait of one of the two photographers, Avraham Yossel Rotenberg, who died in the Holocaust. The photos on view are part of a much larger collection, segments of which have also gone to the YIVO Institute in New York and a Holocaust gallery in Toronto’s Adath Israel Synagogue, Gottesman said. Rotenberg saved many of the photographs during the war by giving them to a Polish non-Jew for safekeeping and retrieving them afterward. Others were sent abroad as postcards, which he later collected from the recipients. The prints were donated to the shul by his widow, Shoshana Rotenberg, and family, who had previously loaned some prints to the congregation for its centennial celebration two years ago. Most members of the downtown Stashover Shul, which was located on Dundas Street near Beverley Street, were originally from Staszow.